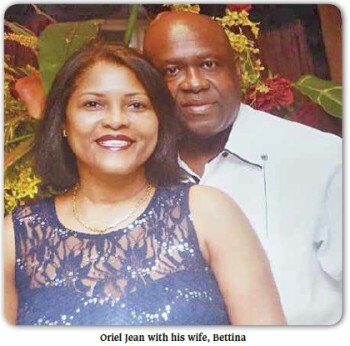 Oriel Jean and his wife Bettina. In what many suspect is a political assassination, Oriel Jean, 50, the former security chief of President Jean-Bertrand Aristide from 2001 to 2003, was shot to death by gunmen on motorcycles shortly after 3:30 p.m. on Mon., Mar. 2 near Delmas 30, not far from the offices of Claudy Construction in Parc Mirdoré on Delmas 33 where he worked. According to his assistant Kenny Faustin, Oriel had just finished taking out US$10,800 for payroll from the Sogebank at Delmas 30 and was driving a grey Toyota pick-up with a Dominican co-worker named Maldonado with the money in a bag on the back seat when the car was struck from behind by a motorcycle. When Oriel got out of the vehicle to see what had happened, assailants shot him twice in the stomach and heart, took the money as well as a bag which contained his gun, and fled in the direction of the Simon Pélé neighborhood. Oriel died at the scene, face down on the pavement. The assailants were six men on two motorcycles, according to witnesses. Mr. Maldonado, who fled the vehicle when the attack began, was not harmed but was apprehended by the police. 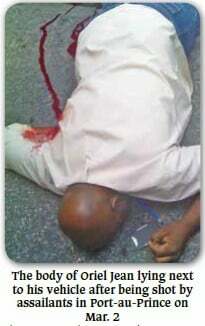 According to some press reports, the police have stated that no money was stolen from the vehicle. Oriel, who was known to his friends as “Roro,” had returned to Haiti in September 2013 after spending about seven years working as a parking lot attendant at the Ft. Lauderdale-Hollywood International Airport following his release from prison in September 2006. He spent two and a half years jailed, with a year on probation, after accepting a plea bargain for “Conspiracy to Commit Money-Laundering,” the same charge and sentence given to other high-ranking Lavalas government officials swept up in a politically-motivated legal campaign by Washington against Aristide following the U.S.-backed Feb. 29, 2004 coup d’état. “In my first meeting with U.S. prosecutors after I was extradited from Canada [in March 2004], they said I wouldn’t have to spend a day in jail, they’d give me money, a new identity, witness protection and so forth if I would only testify against Aristide,” he told Haïti Liberté in a series of interviews in 2007. “I refused the offer, telling them that Aristide was not involved.” Oriel did however testify against drug trafficker Serge Edouard, alias Sergot Persévérance, who was convicted in U.S. Federal Court in Miami to a life sentence in September 2005. Although Oriel never testified against Aristide, the Miami Herald ran several articles implying just the opposite, like one on May 25, 2004, that called Oriel “a U.S. government informant” who was providing “information about Aristide’s inner circle.” Oriel only testified to convict kingpin Serge Edouard. Oriel was born Jan. 1, 1965 in Port-au-Prince to an Adventist pastor, Odiyel Jean, who now lives in Cazale, and his mother, who was from Port-de-Paix. After the fall of the Duvalier regime in 1986, Oriel became politically involved, militating for three years with the National Popular Assembly (APN) popular organization before moving to Canada for three years from 1989 to 1991. He returned to become a part of President Aristide’s security detail in 1991 and lived through the Sep. 30, 1991 coup d’état, which he described in graphic detail to huge audiences which greeted the Brooklyn premiere of the PBS documentary film “Killing the Dream” at Medgar Evers College in 1992. After getting additional training from Swiss policemen while in exile, Oriel continued to work with Aristide’s security corps in Washington, DC until October 1994, when he returned with Aristide to Haiti. After President René Préval came to power in 1996, Oriel and his friend Nesly Lucien became respectively the assistant director and director of National Palace security. When Aristide returned to the presidency in 2001, Oriel became chief of Palace security while Nesly became the chief of police. When the George W. Bush administration launched its destabilization campaign against Aristide in 2001, it began focused its propaganda assault on the various officials around Aristide, including Oriel and Nesly.